Based on the industry feedback from a large group of experts including our alumni and friends, we decided to restructure the MBA Program in an effort to give its flagship elite market position back to MBA, SDSB. One of the major concerns prevailing in the market regarding LUMS MBA graduates was that the students lacked local knowledge and understanding of Pakistani industry. Therefore, we decided to introduce Experiential Learning component in MBA curriculum to compliment case study pedagogy where students put themselves in the shoes of the CEO in a class room setting to take business decisions for four days of the week and connect with the field over the weekend to develop an understanding of Pakistani industry in parallel. Experiential Learning has three components: Sectoral, Experiential and Empirical Diagnosis (SEED), My Startup, and MBA Consultancy Project (MCP). SEED lays a solid foundation of subsequent components of experiential learning by engaging students in such a way that they study different concepts and tools of various functional areas, while also studying the practical application in the local industry and develop sector specific industry note as an outcome. The execution of EL I, SEED, was based on the personal network of our faculty members who identified ten sectors for MBA 2017 and MBA 2018 each during the first semester of MBA. Students were allocated sectors based on the strategic importance of the selected sectors for Pakistan. Dr. Anjum Fayyaz requested faculty members to participate as faculty advisors to student groups according to their interest in the sector. To facilitate the process, Dr. Anjum connected sector specific student groups with industry mentors, initially identified based on faculty network, to proceed with the field learning. Throughout the week MBA students were given case studies published by Harvard, Ivey, and LUMS on foreign and Pakistani organizations in a ratio of 80:20 (80 foreign and 20 local case studies). Throughout the four out of five days of the week, students studied the theories, concepts, and tools in the core courses of MBA curriculum to explore various dimensions of a business setting using case method pedagogy. Over the weekend. 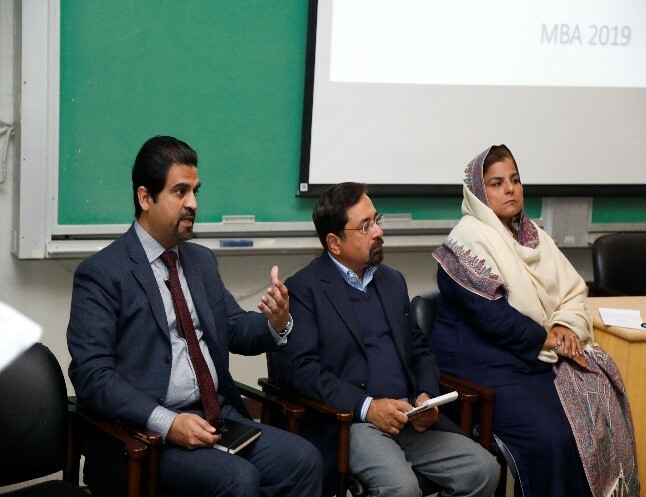 student groups were required to connect with their industry mentors to get an understanding of those concepts in their sector in a Pakistani industry context. Therefore, every alternate Friday was dedicated to sector specific functional area presentation such as operations management, marketing management, finance, human resource management and organizational behavior. And every other alternate Friday was dedicated to their attitude development while nurturing student mindset. While discussing a case study in a class room setting, students put themselves in the shoes of a CEO and practice decision making skills as if the profitability and sustainability of that organization are dependent on their decision. As a simultaneous process, they were required to understand the application of these concepts not only in the local industry but also identify the gaps between the western industry and the Pakistani industry in each sector. On Fridays, the student groups had to present their findings in front of the entire class, a group of instructors, and few industry experts to get feedback on their understanding of a relevant sector. Therefore, over a period of one semester, students get a broad understanding of all functional areas in each sector to some extent. 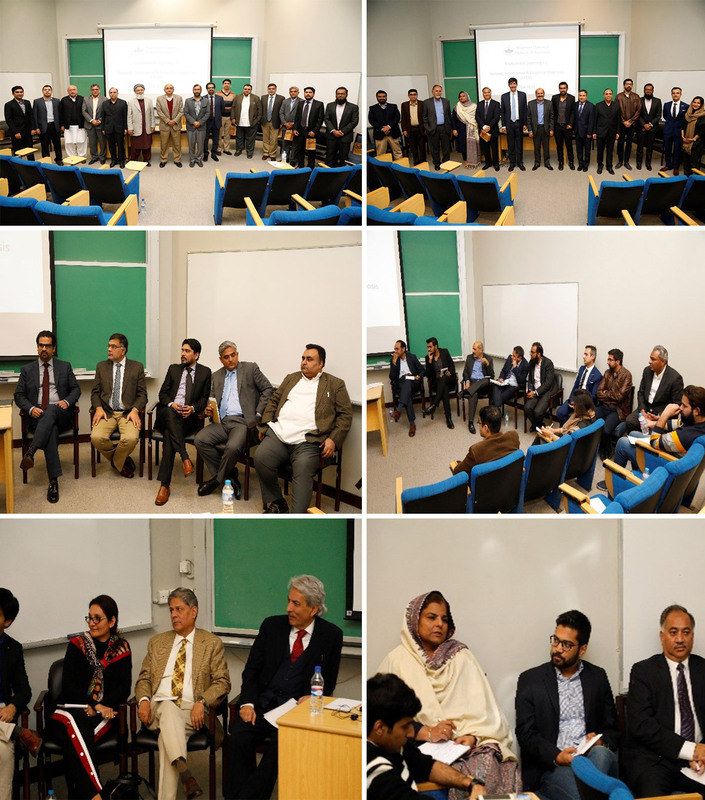 At the end of the semester, they had the final round of presentations on Tuesday, January 2, 2018, where students presented an over view of their sector with the perspective of their functional areas such as: operations management, human resource management, accounting and finance, and marketing management. Industry mentors and guest speakers were invited for the final round of presentations to provide valuable feedback to our students on their effort and how it could be improved further. We also invited additional industry experts during the semester, who were not engaged in the process of mapping the concepts and tools on the sectors so that they could provide feedback from a neutral perspective. Some of the industry experts invited were: Aamir Chaudhry, Business Manager Soda Ash, ICI; Adeel Rafique, Chief Executive Officer, Rafiq Group of Industries; Affan Sherwani, Graduate Recruit, Sada Ash ICI; Arif Jalil Piracha, Chief Executive Officer, Klockwork; Ashar Shami, Consultant for Pakistan, Gobal Data Limited; Atif Tufail, Chief Human Resource Officer, Akhuwat; Ayesha Naweed, Managing Partner, Value Added Solutions and Training; Badar Khushnood, Chief Executive Officer, Bramerz; Darshanie Saman Kumari Pahalagamage, Journalist, Sri Lanka; Faisal Iqbal, Corporate Head Central, Meezan Bank Limited; Farooq Malik, Chief Executive Officer, Interwood; Hafiz Abdul Baseer, Chief Executive Officer, Behtreen Leather Enterprises; Hamid Zaman, Managing Director, SEFAM; Hassan Said, Owner, Total Parco Pump; Jawad Shaikh, Managing Director and Managing Partner, Taazo and Epiphany Ventures; Khurram Bakhtayari, Chief Financial Officer, Packages; Malik S Sarwar, Chief Executive Officer, K2 Leaders Inc; Naseem Zafar, Lead Facilitator, Training Impact; Nasser Aziz, Consultant, Independent Consultant; Naweed Sharif, Financial Consultant, International Finance Corporation; Sajjad Iftikhar, Chief Commercial Officer, Packages; Sajjad Seyyed, Chief Executive Officer, Excellence Delivered; Salman Mian, Visiting Faculty SDSB, LUMS; Syed Adeel Anwar, Head Human Resource, Coca Cola International; Tanvir Shahzad, Correspondent, DW; Usman Bhatti, Director Marketing, Nestle; Withanage Diana Udayangani Withane, Journalist, Sri Lanka; Yasar, Chief Executive Officer, Stylo.